Boards4Health Multi-Slant Pro is a great calf stretching unit that is designed to enhance spine alignment, to help with things like migraine, sore achilles tendon (and gastrocnemius and soleus muscles), TMJ- temporomandibular joint dysfunction, chronic lumbo-sacral pain and degenerative hip (and aligns the hips with feet) with an easy, safe and unique locking at 10, 20 , 30 and 40 degree angles (allows you to monitor your progress precisely) and anti-slip bottom and top surfaces. It is very easy to set up and use and is suitable for both domestic and commercial use for both rehabilitation and prevention purposes by sports teams, athletes, therapy clinics or anyone that wants to improve the above conditions and more. Multi-Slant Pro has an attractive design, quite a solid build quality- is very well-made, durable and feels very stable when you go on it to stretch your lower legs, even though it looks quite simple in construction of three pieces of wood etc. at first glance. It has a foot area of 16 x 16 inches which means it will fit a men’s shoe size of up to 13.5 inches comfortably and can carry a maximum user weight of up to 300 pounds with no problems- it is a very sturdy unit. You can easily fold it to make it only 2 inch thick and flat- becomes very portable and you may store it in your closet or under your bed or couch easily. You can use it for strength training by doing regular or eccentric calf raises and it will help enhance both the strength and flexibility on your legs. You will find the proper instructions inside the box but one thing to point out is just make sure you use it with your back leaning against the wall for more stable and safe stretching and this way you can also use it longer and achieve better results. If you wish to stretch your upper calf just keep your knees locked and your lower calf by bending them a little. You may think you could just use the stairs to do your calf stretches but the main advantage of using this kind of stable slant board is you will do your stretches in a much more controlled and safe manner and involving different angles from 10 to 40 degrees. 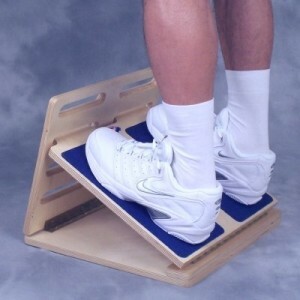 You have to use a safe and stable unit such as this one when you’re stretching your calves as in case of an accident of board giving way you could easily have an injury or your existing problem could get worse. It works on your important lower body parts that involve standing and walking as simple as the design and construction may seem and if you find the price a little high just think of the cost of physical therapist. And yes the price is higher than competitors and so is the build quality and functionality.